Suzanna Fatyan, one of Uzbekistan's finest tour guides, is also an obsessive foodie. She hunts down seasonal foods, and visits markets and restaurants all over Uzbekistan. 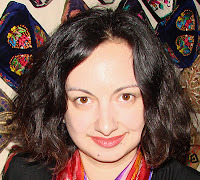 She will contribute regular articles recommending the best places to eat in the cities visited on Uzbek Journeys tours, as well as pieces about Uzbek cuisine. Here Suzanna describes where to eat well in her home town, Samarkand. Uzbekistan is the land of famous melons, the sweetest fruit, excellent raisins and the tenderest lamb in the world. For centuries Uzbekistan was famed for its gastronomy: Omar Khayam admired Samarkand wines, gourmets of China appreciated the sweetness of Samarkand peaches, merchants, exhausted after long, dusty trips along the Great Silk Road enjoyed Samarkand plov, lamb, non and other specialties. Samarkand remains a centre of fine food today and I would like to share with you several places that Samarkand people really like. Plov is Uzbekistan’s famous specialty: it is prepared for the most important events and for the most respected guests. Every region of Uzbekistan offers its own recipe of this fabulous course. At the Bedonali Kazi Palov restaurant at 33 Makhtumkuli St. (near Busygina) you will find very special plov. It contains not only common lamb and beef but also quails stuffed with fatty tail and spices. (Fatty tail is prized in Central Asia and the Middle East. Some sheep are bred to store fat in their tails. A mature ram’s tail can carry up to 12 kgs of prized fat, which is softer and more delicately-flavoured than fat stored inside the body). Another unusual feature of Samarkand plov is yellow carrot, a vegetable only found in Central Asia. Red carrot is also widely used in Uzbekistan but not for Samarkand plov. Bedonali Kazi Palov is not open on Sundays. Tel: +998 66 2225318 or +998 66 2627717. Another “must try” for every visitor is samsa! 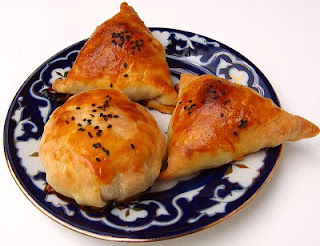 Hot, just taken out of the tandoor puff pastry, filled with a mixture of lamb, beef and juicy onions makes you forget your name and want stay in Uzbekistan forever. One of the best samsa spots is a little chaikhana at the crossroads of Dagbitskaya and Vohid Abdullaev Streets. It may be hard to find: it has no name and the only immediately noticeable hint is a line of cars near a big white gate that looks like a private house. But experts know. Here you not only eat the best samsa but also see samsa baking in the tandoor. Time your visit carefully as it is closed on Sundays. Chickpeas are generally known as the key ingredient of hummus. In Uzbekistan they are cooked along with meat. Nuhat shurpa is a dish that attracts Uzbeks to Samarkand and the best place for trying is situated at the start of the road leading to Tashkent. It is very easy to find: right before Ulugbek’s statue at the observatory, there is a small street. The restaurant is not visible from the road but any local person will point the way to it with great pleasure. Again, the number of cars nearby is a significant clue. Look for the sign on the street pole! Should you find a vacant table you will first be served a wonderful bullion, followed by fresh salad and then most importantly, chickpeas and tender lamb that has simmered for a long, long time, served in a traditional dish. 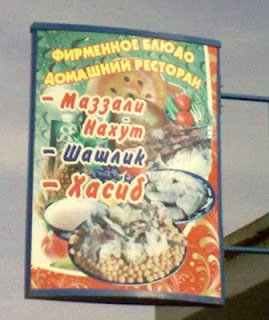 Generally, authentic Uzbek cuisine is available at lunchtime. Especially plov and samsa. Evening is the best time for shashlyks and kebabs. I recommend the Karimbek and Standart restaurants. Karimbek is situated at A.Timur St. and designed in both traditional and European styles. 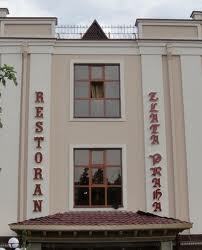 If you suddenly hanker after European cuisine I highly recommend the Zlata Praha, a Czech Restaurant in Samarkand. Besides traditional Czech sausages and good local beer, the restaurant offers a choice of vegetarian courses, desserts and coffee. 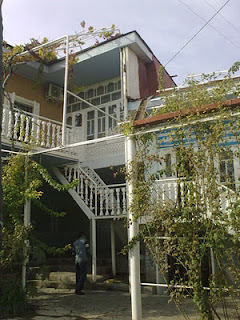 Situated at 59 M. Ulughbek St. (former K.Marx) near Korzinka. Tel: +998 66 233 66 39. If you are looking for a quiet evening, coupled with a beautiful view and cup of refreshing green tea, head over to Anargis Art Café, at 12 Tashkent Street near Bibi Khanum mosque. (This restaurant is run by designer Nargis Bekmuhamedova). Here, you can also enjoy lunch or dinner consisting of traditional Uzbek dishes like lagman (noodles, vegetable and meat) and manty (steamed dough filled with meat and onions) and borscht. Platan is also recommended for evenings out. 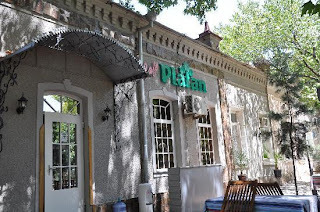 The restaurant offers a synthesis of Uzbek, Russian and Armenian cuisine. It has a good choice of light salads and very delicious lamb and prunes. It is located in the 19th century part of Samarkand at A. Pushkin St. There are outdoor tables, a non-smoking room (usually quiet and suitable for dates and chats), and a general room – nice but noisy in the evenings. Telephone for reservations: +998 66 2338049. Often locals and visitors alike are in a rush at lunchtime. Should you find yourself in the 19th century part of Samarkand and in a hurry, stop by a Turkish eatery called Istanbul Kebab. It offers both buffet and a la carte menus. The sweets are wonderful and so too the real Turkish coffee. Istanbul Kebab always has a choice of vegetarian dishes, light soups, kebabs, Turkish pies and many other things to keep you happy and strong for the rest of the day. It is in an easy-to-find spot at Navoi Street (formerly Mustakillik, formerly Lenin Street – the street names vary according to how old your map is). 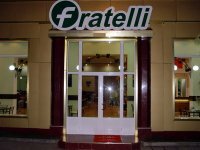 Within walking distance from there is another fast food stop, Fratelli. Located at 31 Amir Timur St, Fratelli offers pizzas, salads, sweets and coffee. It is a popular destination among students and young couples although can become noisy. You can relax after a long day in Blues Café, 66 Amir Timur St, one of the oldest drinking spots of Samarkand. It also offers good food and a special atmosphere: posters of blues legends adorn the walls. If you play piano you can play some melodies when Eddie, the regular player takes a break! Blues Cafe is a very small café, and you should reserve in advance. Tel. +998 66 2336296. The Orient was always famous for its luxury, and Samarkand restaurant will help you feel it. Designed like a Sultan’s palace, Samarkand is a true melting pot of cultures, traditions, and styles. It offers both Uzbek and European cuisine and is an excellent venue for a farewell dinner. On the second floor is a lovely Russian-style room, where you can also dine. It is situated near the wine factory at 54 M. Koshgari St. Tel: +998 95 5005559 or +998 66 2601339.